"The Top Notchers went above and beyond to help in any way they could for the success of the "Flavors of America" fundraising event for the Pacific Chorale (Orange County). I couldn't recommend them HIGHLY ENOUGH!! They were on time, looked superb, and their music was fantastic... They delighted every one of the guests. A real hit!" Top-Notch is an active barbershop quartet that promises lots of "audience appeal and high quality show entertainment." So recommends the membership of the six-time International Chorus Champs, Masters of Harmony, their home chapter. Top-Notch is a "sure bet" to be heard often! 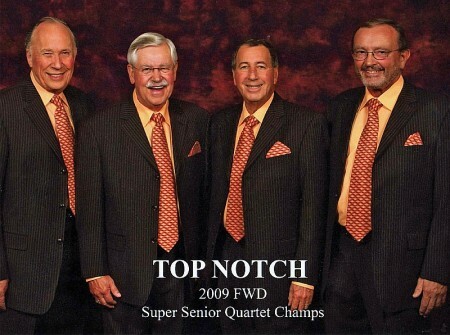 Though Top-Notch is weighted down with barbershop gold, (they're the 2009 Super Senior Champion Quartet in the Barbershop Harmony Society Far Western District, after all...) they're a light-hearted foursome who will delight you when you invite them to your next event. As a featured act on your show, or as a bit of excitement at a private party or convention, you can expect Top-Notch entertainment.